In October, the United Nations (UN) released a report which highlighted that the world could be on the brink of a climate change disaster if immediate measures are not taken. Leading scientists behind the report have said that the world only has 12 years to keep global warming at a maximum of 1.5 degrees Celsius or it could face a risk of severe drought, flooding and extreme heat for millions of people. The effects of climate change have already been seen in the region. Alex Chapman, a research fellow in human geography and the head of department of water resources at Can Tho University wrote that Vietnam’s Mekong Delta – home to 18 million inhabitants – is one of the world’s most vulnerable places to climate change. Other experts working in the Mekong have shared the same concerns, pointing out that rising waters, storm accentuation and on-shore salinity are the main factors endangering the populations surrounding the river. One of the key ways to combat climate change is by using renewable energy instead of being reliant on fossil fuels, natural gas or coal since most renewable energy sources produce very little or zero global warming emissions. In a joint statement released by the Association of Southeast Asian Nations (ASEAN) and the International Renewable Energy Agency (IRENA) last September, ASEAN has set a target of securing 23 percent of its primary energy from renewable sources by 2025. This target may seem ambitious but with better cooperation among ASEAN member states, it could become a possibility. 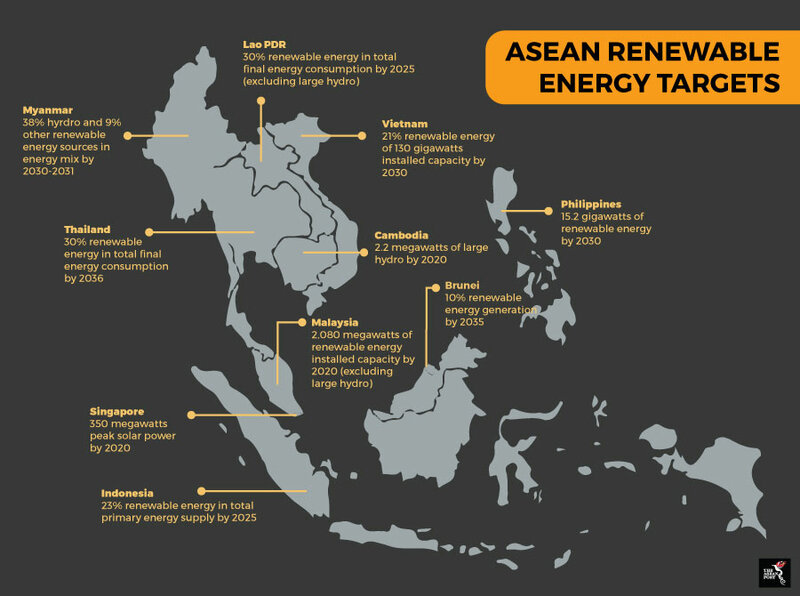 The ASEAN Centre for Energy (ACE) has released a study on regional renewable energy cooperation in ASEAN in hopes that it would help strengthen discourse on renewable energy cooperation within the region. The paper highlighted that cost-reductions on renewable energy would be one of the major benefits of renewable energy cooperation in ASEAN. With more cooperation among member states, it could help remove barriers to obtaining permits, which the study points out is one of the primary causes of delay for renewable energy development. This would then also cut developer costs. Lower costs could attract more investment for renewable energy within the region. According to the ACE study, regional renewable energy can also enhance energy security as it reduces import dependencies. Energy security refers to the availability of energy at affordable prices. As countries invest more in renewables, they would be less dependent on energy imports to fuel their nation’s energy consumption needs. For example, ASEAN members with similar energy security challenges can coordinate the development of renewable energy in the region. Overall, this would improve the energy mix and grow their energy security. Regional cooperation is imperative if ASEAN wants to achieve their renewable energy target for 2025. One of the benefits of cooperation among ASEAN states with regards to renewable energy is that it would create space for dialogue and better coordination. The European Union (EU) has a similar framework, dubbed the “CA-RES” programme, which provides a forum for EU nations to exchange knowledge and to put into practice examples of the implementation of renewable energy policies. ASEAN have already made positive moves towards more cooperation within the region for renewable energy. ASEAN and IRENA signed a Memorandum of Understanding (MoU) in September last year for long-term cooperation between the two bodies and to harness ASEAN’s renewable energy potential. ASEAN is also implementing the ASEAN Power Grid, which aims to enhance electricity trade across regional borders – complementing the rise in demand for electricity. The ASEAN Power Grid looks to integrate infrastructure that is both, clean and sustainable. One of the projects under the ASEAN Power Grid is the Laos-Thailand-Malaysia-Singapore Power Integration Project. This project involves Malaysia purchasing up to 100 megawatts (MW) of hydro power from Lao PDR through Thailand’s transmission grid. This is beneficial for Malaysia because it would also improve the share of sustainable energy in their total energy mix. The study by ACE also shows that while there can be huge benefits from regional cooperation, there are also strong obstacles which could impede them. One of the biggest challenges is financial constraints. The study shows that the deployment and transfer of renewable energy technologies requires large funding. It was reported in the media last year that half of Southeast Asia’s renewable energy projects are not financially viable. This poses a serious problem if ASEAN wants to meet its target by 2025. Especially with IRENA reporting that the region’s energy demand has grown by 60 percent over the past 15 years, and is only expected to keep on growing. Clearly, ASEAN governments need to seriously consider renewable energies when planning their energy mix.